Health bloggers Arielle Zinn and Katie Buttress-Grove take us through a curated stay in Melbourne, with a foodie focus. 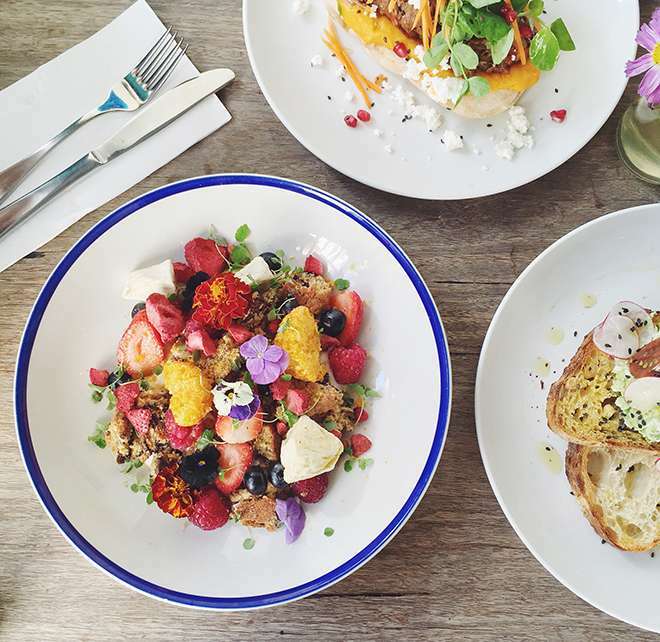 We like to brag that Melbourne takes the (sugar-free) cake when it comes to healthy eating. From organic superstores like Aunt Maggies and Terra Madre to high-profile dining spots such as Top Paddock and Yong Green Food, there’s no shortage of hip and healthy foodie options in our town. And who better to critique it than some out-of-towners? Sydneysiders Arielle Zinn and Katie Buttress-Grove (better known as @cocohealth and @_squeakyclean, respectively) took a trip down for a weekend of wining and dining at The Larwill Studio. Here’s their stay, curated. Arielle: A Sydney-based full time law student so right now most of my days are spent studying/at uni (fun fun fun!). Being a massive foodie, I also make plenty of time for exploring new (mostly healthy) cafes and restaurants around Sydney and dragging my friends with me. Katie: I'm a Sydney based gal living the city life who is obsessed with good food. My full-time job sees me working as a Digital Content Manager for FOOD TO LOVE, and working with magazines such as Australian Women's Weekly and Woman's Day. I'm constantly surrounded by photographs of beautiful food and drool-worthy recipes... And I am constantly hungry! Arielle: Well, if we're talking literally it was the amazing Larwill Studio (as we landed in Melbourne quite late at night), which we fell in love with instantly! But if we're talking food stops (as our weekend in Melbourne was predominantly a foodie trip) our first cafe visit was Top Paddock in Richmond. I can confidently say the famous ricotta hotcake is as delicious as it is beautiful. Katie: The Larwill Studio... Straight off the plane and to the hotel. We spent our first exploring the room, snuggling in our bath robes, sipping complimentary T2 'sleepy tea' and watching trash TV. We both woke up refreshed and comfortable after an amazing sleep in an extremely comfortable bed! K: A hot shower, followed by a mug of tea with a big breakfast. I believe in fueling your body for a productive day ahead every morning, and find that the bigger breakfast I have, my concentration and energy levels are significantly better throughout the day. A: Chapel St and Brunswick St are great! I love the shopping streets in Melbourne as opposed to big shopping centres, which is something Sydney definitely lacks. I was also blown away by the variety of health foods and amazing bargains at Terra Madre in Northcote - I could have spent hours browsing the aisles! K: For clothing, the factory outlets on Smith Street - I'm a sucker for bargains. Food wise, I discovered two new favourite health stores during my stay in Melbourne; Terra Madre in Northcote and The Source Bulkfoods in Prahran. A: This question is just SO tough and picking one is an absolute struggle. Melbourne's food scene is simply second to none. I'm going to have to choose two. For breakfast, Tall Timber in Prahran, hands down. Their chef is so incredibly talented and every dish on the menu is full of flavour and just perfection. For dinner, Chin Chin in Melbourne CBD is phenomenal. The three hour wait was worth every second. K: Feast of Merit - the dinner options were absolutely divine. I loved the fact all their produce is organic, local and sustainable, plus tastes extremely delicious. Middle Eastern food is up there with one of my favourite cuisines and FOM didn't disappoint. A: The food, obviously! The cafe scene is just amazing. The interiors and layout of the cafes are so beautiful, and the food is as exquisitely presented as it is flavoured. Melbourne just get food. Simple as that. K: The food! No question about it. You know when you book flights and accommodation purely with the intention of eating the whole weekend, it's gotta be good. Melbourne's brunch scene is on another level. Tall Timber and BARRY were some favorites from the trip. Recently, we hosted Gigi Hop from @_itsbeautifulhere at The Cullen. Click through for the savvy traveler's hottest tips for a Melbourne staycation. Indulge in Melbourne’s love of the best coffee drop at public cupping sessions from North Melbourne Roastery Seven Seeds.